It was a classic 1 vs. 2 matchup that lived up to the hype. But as all good things, it had to come to an end, and Muskegon sealed the victory over Lowell in noteworthy fashion. With a convincing 36-21 win over the Red Arrows, the Big Reds move to 4-0 and earn our vote as the best team in Michigan, regardless of division. And, yes, we have seen Cass Tech play this season. The Big Reds jumped out to an early double-digit lead, but Lowell fought back thanks to elusive quarterback, Titan Anderson. Anderson looks to be on-par with the Red Arrows’ string of recent QB greats. He plays the position with a high football IQ, has great pocket presence, and a good arm. He also ran the ball well against a tough defense. The other bright spot for Lowell was wide receiver Jeff Houston. Houston ran good routes and caught every ball he got his hands on. 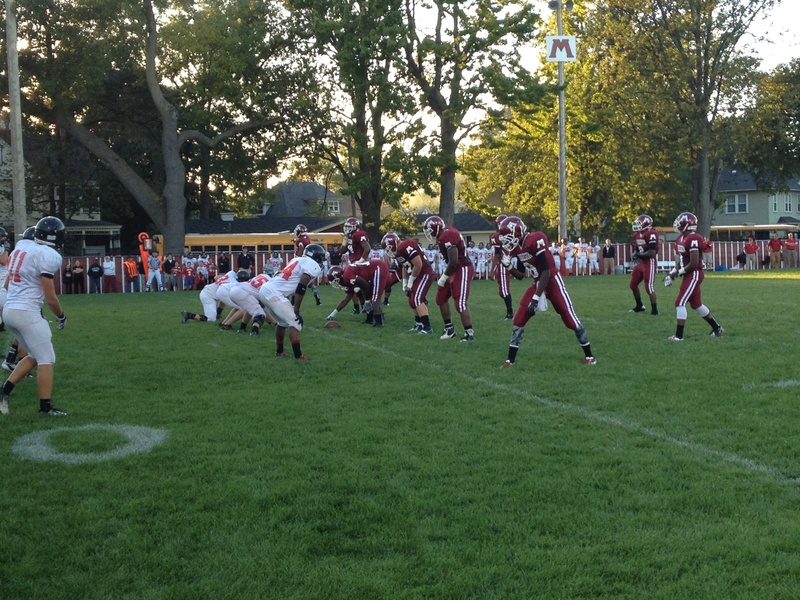 Despite the spark of Houston and Anderson, Muskegon’s defense eventually wore down their opponents. Leading the defensive charge for Muskegon were the usual suspects upfront, junior Kenneth Finley and senior Ronald Jenkins. Both wreaked havoc in Lowell’s backfield all night. Senior Demetrius Brown provided the leadership and enthusiasm to excite both teammates and fans. Playing as a hybrid safety/linebacker, Brown is the clear emotional leader of the Big Reds defense. He plays fast and manages to get near the ball on nearly every single play. Another standout on D for the Big Reds was junior linebacker William Hunt. Lowell just couldn’t block him. He’s a prototypical linebacker with good feet and is a sure tackler. He added a few big sacks on the night and it was easy to see why we have him pegged as one of our top 2014 prospects. Offensively, Muskegon was led by Marcus Smith, a senior running back who is returning to the field after missing two football seasons for various reasons. Smith has a rare combination of good speed and good quickness. He can stop on a dime and make you miss, or just simply outrun you. He finished the night with 145 yards and three touchdowns, including an 85-yarder in the second half. He’s currently being recruited by GLIAC schools, but could develop into a MAC-level prospect by season’s end. Muskegon’s talent is apparent. Coach Shane Fairfield estimated that his team has seven players who could play at the college level on his current defense. Just on defense. Offensively, they have several more prospects. But, it’s not just the talent, Coach Fairfield has his players buying-in and playing with great passion and mental toughness that sets them apart from other teams. It was particularly fitting that current Ferris State football coach — and former Big Reds coach — Tony Annese was on-hand to watch tonight’s showdown. Annese led Muskegon teams to the 2004, 2006, and 2008 state titles. This current Big Reds team looks eerily similar to Annese’s state championship teams.